What is a good curriculum? Curriculum is one of the three tiers of WordParts. Next Generation Systems partnered with WELCOME TO SUCCESS and Roberta Ford to integrate GRAMMAR With a TWIST© (GWAT) with WordParts. GWAT has a distinguished history of success reaching back to its beginnings in 1971. Over 500 teachers in the Denver, Colorado area have shared it with their students and have validated its ability to teach grammar to all ages and abilities. It works for all ages and all abilities, K-12. It takes the abstract concept of grammar and turns it into something concrete that students can get their hands on and wrap their brains around? It makes sense. It follows an exquisitely constructed, step-by-step approach and unfolds grammar in a logical progression which builds from one topic to another. Combined with WordParts, it taps into visual/spatial, verbal/linguistic, musical/rhythmic, logical/mathematical, bodily/kinesthetic, inter and intra personal ways of learning. Using it consumes minimal class time. It benchmarks directly and effectively supports the current emphasis on The Common CORE State Standards (CCSS). It improves student writing by providing opportunities for students to recognize language components and constructions and then use them to make their writing more effective. It is: painless to teach and painless to learn. 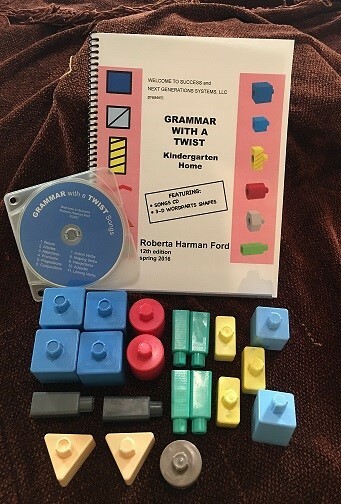 Our initial offering, GWAT K-2, includes everything needed to teach Grammar. Comes with a CD that has catchy “parts of speech” songs that children love to learn and sing. Includes a backpack that contains twenty shapes that represent 8 parts of speech.